ATLEC’s paper “Providing assistive ICT learning for people with disabilities through a personalised mobile application” (Authors: Stavroula Papavasiliou, Karel Van Isacker, Constantinos Mourlas, Maria Saridaki) was accepted as full paper for presentation at the 14th IEEE International Conference on Advanced Learning Technologies (ICALT 2014). ATLEC is being presented by PhoenixKM at the Plovdiv International Disability Fair (Bulgaria) from 20-24 March 2014. This event is organised by the European commission and the Federation of Employers. The CAVA 2014 conference (VI International Conference of Adaptive and Accessible Virtual Learning Environment CAVA 2014, Promoting an Inclusive Learning Culture) renews its goal of being the most important Latin American forum in which scientists, professionals and students exchange ideas and share their research results in the domain of Inclusive and Adaptive. ATLEC project coordinator Karel Van Isacker will present ATLEC outcomes in his presentation “Inclusion in Europe: a holistic view on the many affected domains to support integration and employability; the Belgian case study”. It will address in a holistic manner how people with disabilities are integrated into society in Europe, in terms of acquiring the needed (basic) ICT and ICT-based AT skills but also in terms of social competences. This will be presented with special focus on Belgium, and how this integration is achieved by using e.g. desktop and mobile based games. 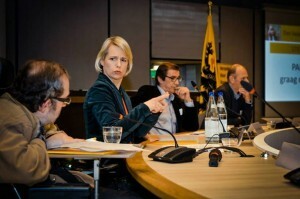 Monday evening 17 February, PhoenixKM was present at the presentation of the leaflet “Een beperking mag geen handicap zijn” (an impairment cannot be a handicap) in the Flemish Parliament in Brussels, Belgium. Throughout the project there have been a range of dissemination events attended by the UK partners including the Times Educational Supplement (TES) North of England Resources Show incorporating Special Needs conference and the North of England Conference. This has raised the profile of the project amongst teachers, trainers and educational practitioners. FAST (Foundation for Assistive Technology) who work with the AT community to support innovation in product development and good practice in service provision have added the aims, objectives and outcomes of the ATLEC project to their online database of AT resources. This represents a particularly successful outcome given that FAST have influence at a strategic policy level in the UK. ATLEC was promoted at the ViPi booth at ONLINE EDUCA BERLIN which took place on 4-6 December 2013 in Berlin, Germany. This is the largest global conference on technology supported learning and training for the corporate, education and public service sectors. 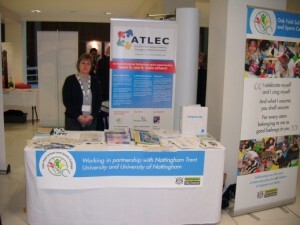 ATLEC will be presented at the 110th “North of England Education Conference – 2014 – Education: Innovation, Creativity, Employability” event, which takes place from 15-17/01/2014 in Nottingham, UK. To register or participate, follow this link.